There were waterworks galore at Balaidos as Celta Vigo’s spiritual leader, Iago Aspas, returned from injury to heroically score the winner against Villarreal in a vital bottom of the La Liga table clash. 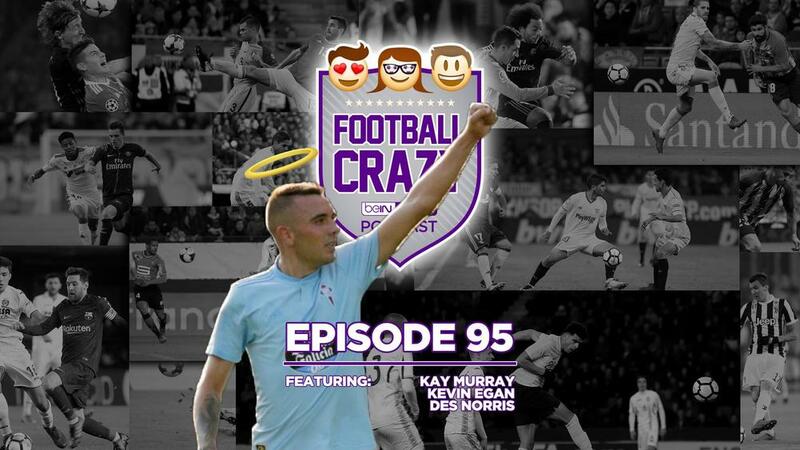 This week's Football Crazy begins its journey at Balaidos - the scene of Iago Aspas' resurrection - before climbing up the La Liga table to relive the latest episode of Lionel Messi getting inside Diego Lopez's head, off-the-leash Atletico Madrid's resounding win over Alaves, and Zinedine Zidane's eye-raising rotations squeaking past bottom-placed Huesca. Part Two kicks off with the Premier League title race, which is alive and well after Spurs reverted to type against Liverpool, while Man City showed relegation battlers Fulham no mercy. Elsewhere in the UK, Huddersfield's survival hopes took a fatal blow against Palace, while a linesman left Cardiff's in critical condition. Across the pond in MLS land, ambipedal Betis graduate Alejandro Pozuelo steals the limelight on his Toronto bow, Sporting KC and LAFC fill their boots, Atlanta's trip to Columbus is a washout, and Wayne Rooney and Zlatan Ibrahimovic continue to justify their DP statuses. We wrap things up in Part Three with a Ligue 1 roundup, a look at the festering wound that is the Spalletti/Icardi rift at Inter, an update on a red card collection to rival Sergio Ramos', and a fresh installment of Power Rankings.